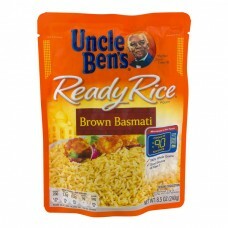 Uncle Ben's® Ready Rice® Brown Basmati. "Perfect Every Time"®. 100% Whole Grains. Good Source Of Fiber†. Microwave In The Pouch. Cooks In 90 Seconds. †Contains 3.5 g Of Total Fat Per Serving. Per Serving: Calories 230, 12% DV. Total Fat 3.5 g, 5% DV. Sat Fat 0.5 g, 3% DV. Sugars 0 g. Sodium 0 mg, 0% DV. Net Wt 8.5 Oz (240 g). Uncle Ben's® ready Rice®. Brown Basmati Rice supports a well-balanced diet. No artificial flavors. No artificial colors. No preservatives. ®/™ Trademarks. Get recipes and more at unclebens.com. We would love to hear from you! (Please have this package available). 1-800-54-UNCLE. 1-800-548-6253. ©Mars, Incorporated. Just heat and enjoy: 1. Squeeze pouch to separate rice. 2. Tear two inches to vent. 3. Heat on high for 90 seconds. 4. Remove from microwave using cool touch area on untorn side. Cooking time for pouches - 2 1/2 minutes. Microwave times may vary. Take care when handling and opening the hot pouch. Refrigerate unused portion. In The Skillet: 1. Gently squeeze the sides of the pouch to break apart the rice, and pour contents into a skillet. 2. Add 2 tbsp of water an heat. 3. Stir rice occasionally until heated thoroughly. 4. Serve immediately.